Powerhouse band Evanescence and Lindsey Stirling positively delighted DTE Energy Music Theatre in Clarkston, MI to an exceptional night of musicality on Monday July 9th. Both acts were joined onstage by a talented live orchestra, which gave their songs a bigger than ever feel. Evanescence has been a force in music since the early 2000’s with their debut album, “Fallen”. In 2017, they returned with a welcome voice to the music world releasing their newest LP, “Synthesis”. 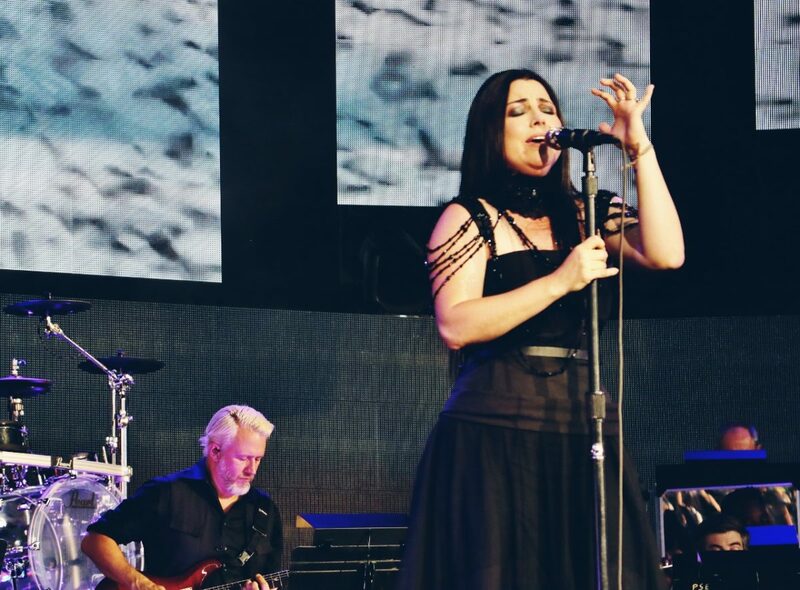 “Synthesis” includes new tracks, as well as reworks of previous material with an exceptional orchestral sound. Since the Evanescence and Lindsey Stirling tour is a co-headling tour, the bands swap order each night to not make either feel more or less important than the other. Evanescence was first on the docket, starting their night at just about 7:45. The sun was still gleaming into the amphitheater before setting over the horizon. 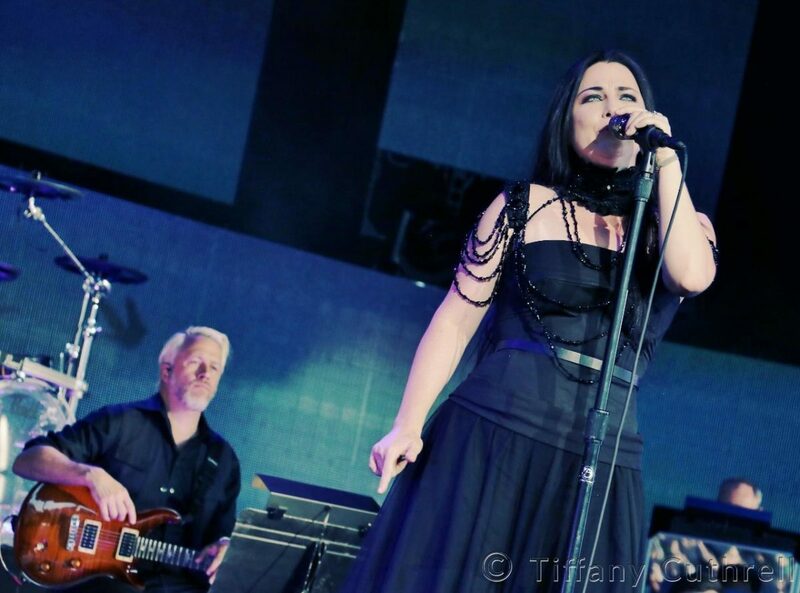 The orchestra was seated first, and a couple of minutes later, the beautiful Amy Lee emerged from stage right. The audience roared with applause at her presence as she waved with a smile. She seated at a black Steinway and Sons piano and began into “Overture”, the opening musical piece from their latest album. After the minute or so of song, Amy stood to take the mic. Next up was “Never Go Back”, redone from the band’s self-titled album. The pairing of Evanescence and orchestra was a truly breathtaking soundscape. During “End Of The Dream”, a flurry of birds projected on the screen behind the musicians. Ms. Lee’s voice soared across each and every fan, a wonderful unity of both power and vulnerability. When the song finished, Amy joked, “It’s all downhill from here”. She thanked the audience and stated how nice it is to be back in Detroit. After “My Heart Is Broken”, Amy gave some insight into the tour. “The tour is special for a lot of reasons. This is the very first time we’ve ever played with a live orchestra. This is the first time playing with these musicians. We pick up local musicians everywhere we go.” There were extra cheers from the crowd, most assuredly for their musical friends and family who were having the extreme honor of playing on stage. 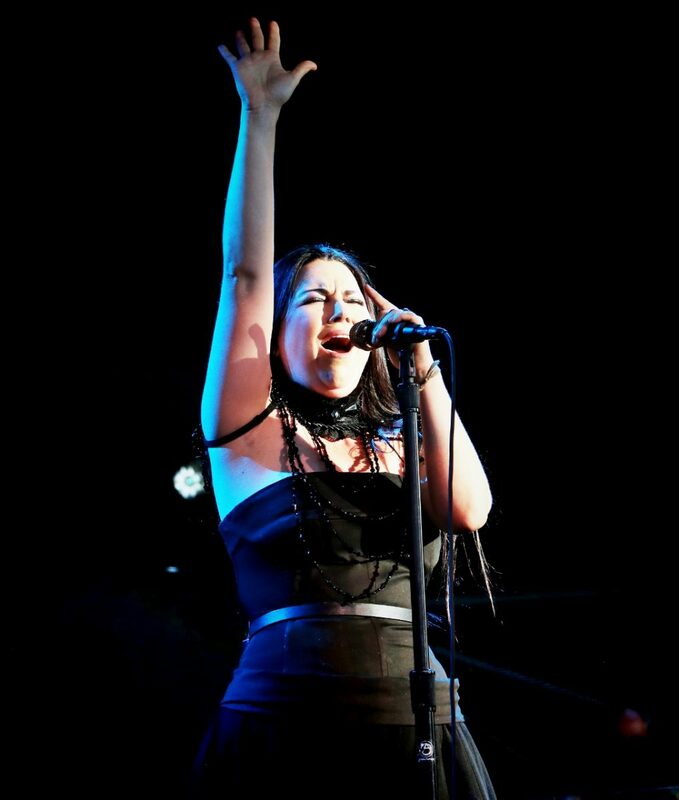 After the recognizable “Lithium”, Evanescence started into the huge track, “Bring Me To Life”. The crowd surged and brought out phone cameras to record. Paul McCoy’s voice was replaced by sweeping music to pair with the chorus. A drummer and percussionist pounded away, still giving the song a heavy feel. 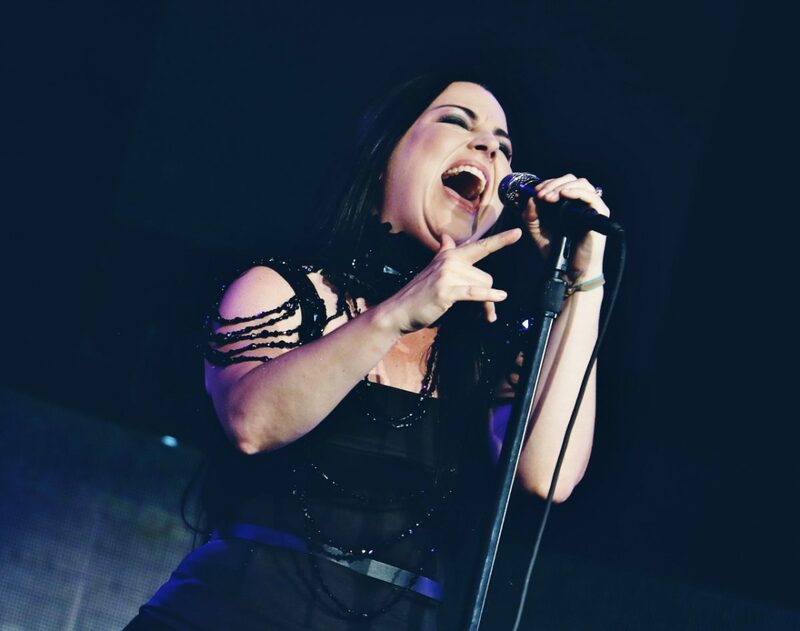 Throughout the show, the other members of Evanescence were seated behind Amy, adding electrifying guitar sound, and backing vocals from Jen Majura. After “Secret Door”, Amy continued that one of her favorite things about music is that it can transport you. “We’re going to play a song that has that power now more than ever.” Evanescnece and orchestra started into a tremendous cover of the Beatles’ timeless “Across The Universe”. 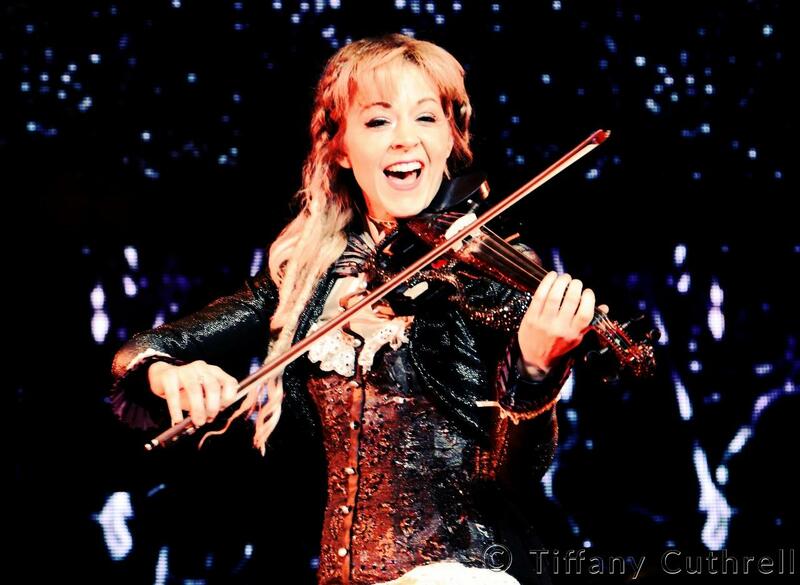 Next was “Hi-Lo”, featuring Lindsey Stirling, who took to the stage with a dazzling violin to beautifully present her musical gift to the song. The song is a collaboration between both artists on “Synthesis”. The band and orchestra started into the haunting, “My Immortal”. When the song finished, Amy blew a kiss to the crowd. The band closed out their night with their new album’s ending track, “Imperfection”. After the song ended, Amy thanked the crowd one more time and said, “Give it up for your amazing orchestra! My amazing band…Our incredible conductor!” The band bound together and bowed, then leaving the stage being showered with applause. After a brief intermission, the incredible Lindsey Stirling was ready to begin. 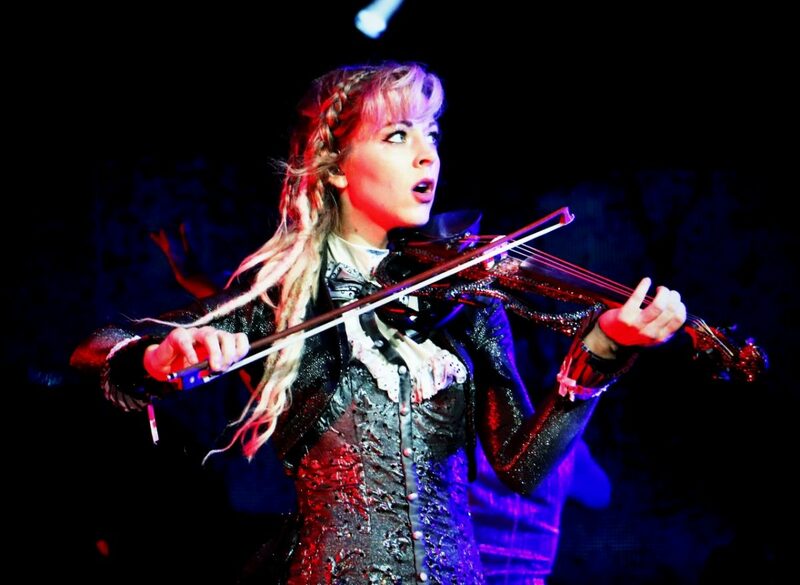 Lindsey is absolutely a stand-alone artist, bringing violin into the forefront of the music scene while melding classical music, electronic, dubstep, and even nodding to video games. Her night started with a powerful poem, paired with images of her journey as an artist… both the disappointments and triumphs – criticisms and acclaim. She started into the tremendous track, “The Arena.” Ms. Stirling covered every bit of the stage, all while playing flawless violin. She danced and jutted, clearly enjoying every moment of putting on such a wonderful show. Next up was another original song entitled “Moon Trance”. Large tombtstones made their way across the stage, along with dancers in skeleton attire. 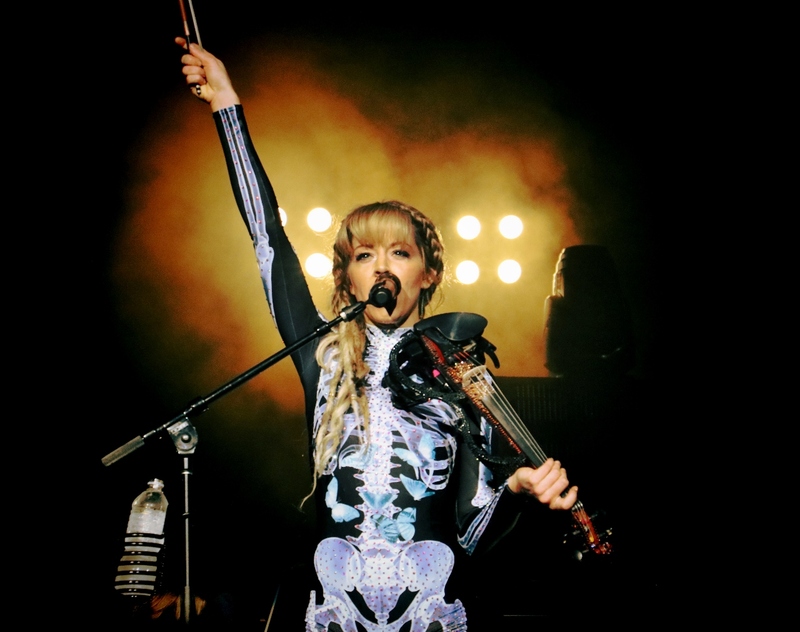 Lindsey also revealed a new black leotard costume with a white skeleton. After the song finished, she took to the microphone, stage right. 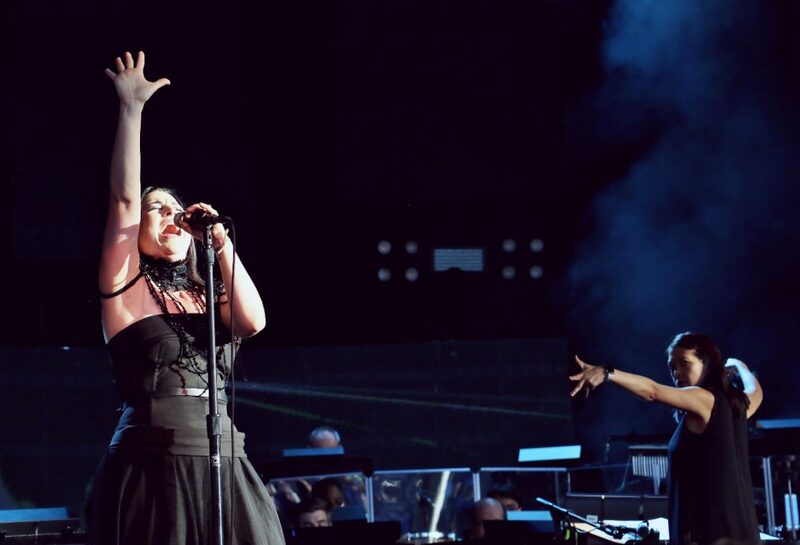 After “Shadows”, Lindsey began into “Shatter Me”, for which Amy Lee joined her once again on stage. Ballet dancers and tutus were abound, emerging to contribute their artistry with the song. The trend continued throughout the night. 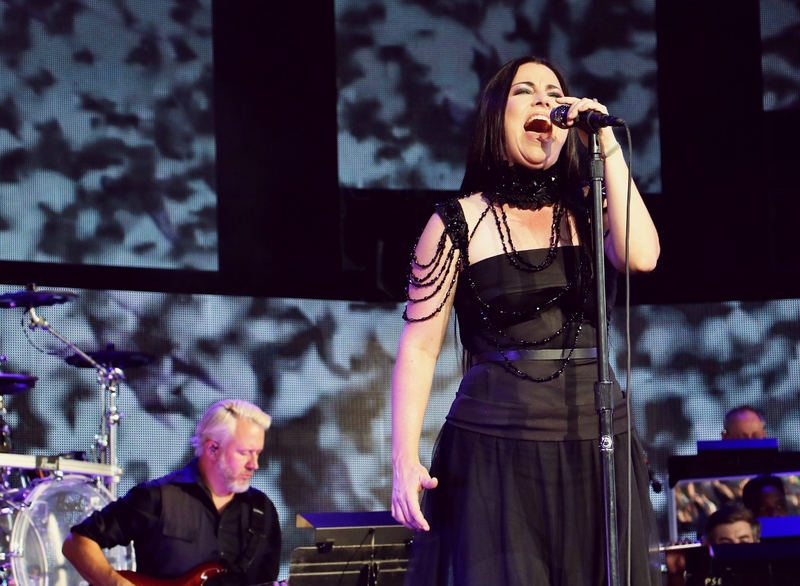 When the song finished, a deafening cheer echoed over the theater as Amy Lee exited. Next up was “Lost Girls, the opening track from “Brave Enough”. Talented dancers gave a gorgeous portrayal of hardship and resurrection, with Lindsey joining them for much of the dancing. “Lost girls find a way” echoed through the speakers, giving the dancing a wonderful metaphor. Lindsey walked again over to the microphone. “Thank you so much! You guys are amazing, Detroit! One of my favorite things about Michigan is that when you ask someone where they’re from, they go like this!” Lindsey held up her hand, making a mitten shape, as all Michiganders do to point to their matriculating location. “Hey, I’m from California!” She held up her arm and pointed in a silly fashion to a spot on it. “Where you guys from? Let me see it.” The lights illuminated to reveal a packed DTE, each fan holding up their mitten hand. “CIRCA 2002” text flashed on the screen before a video played of Lindsey and friends dancing to “Bring Me To Life”. “Ok, maybe I’ve been a little bit more than just a casual fan. That was me at 15 years old! The reason that I decided to show that video tonight isn’t to show off, as cool as it is. It’s because I don’t think anyone would have watched that and thought, ‘Wow! This girl’s got something. That it factor, there is it.’ That’s a pretty powerful thing to share because I had some big dreams. Even when I made that video. The thing is it was obviously not pure talent that made me who I am today. It was a ton of dedicated hard, hard work! No matter if you are 5 years old or 95 years old, we all still have goals. We all still have dreams. If you can see it in your head, even if nobody else can see it, I am standing up here as proof that if you believe it and if you dream it, you can make it happen. When we reach that moment, that experiene when you feel like you’re living your dream, to me it feels almost like I’m flying. This next song is called ‘Take Flight'”. Lindsey took to a raised platform that continued to climb higher and higher above the stage. She was wearing a dress whose fabric continued to ascend as well, rising many many feet in the air. Next up was Lindsey’s original song, “Crystalize”. The audience cheered to greet the track, having recognized it right away. An icy backdrop was reminiscent of that song’s music video. Toward the end of the track, a disco ball was brought onto the stage that reflected light in every direction, all over the theater. When the song completed, an insightful monologue began over the speakers that presented the power of positivite reinforcement, even on something as simple as crystalized water. After new track, “Hold My Heart”, Lindsey took to the microphone again. The open dialogue she presented throughout the night was so very warm, welcoming and uplifting. She started into a very personal story about battling anorexia and depression when she was in college. She explained how she used to look at others who were happy and think they were born that way. With time and effort, she went from simply surviving to healing. Colorful dancers and a colorful backdrop highlighted the song. After “Mirage”, Lindsey encouraged everyone to put their hands together for the band and, “I’m going to ask you to stand up! This is pretty much the end of the show”. The band continued into “Don’t Let This Feeling Fade”, also off of Lindsey’s most recent album. She closed out the night with as much energy and passion as at the start, clearly giving her all to the performance. 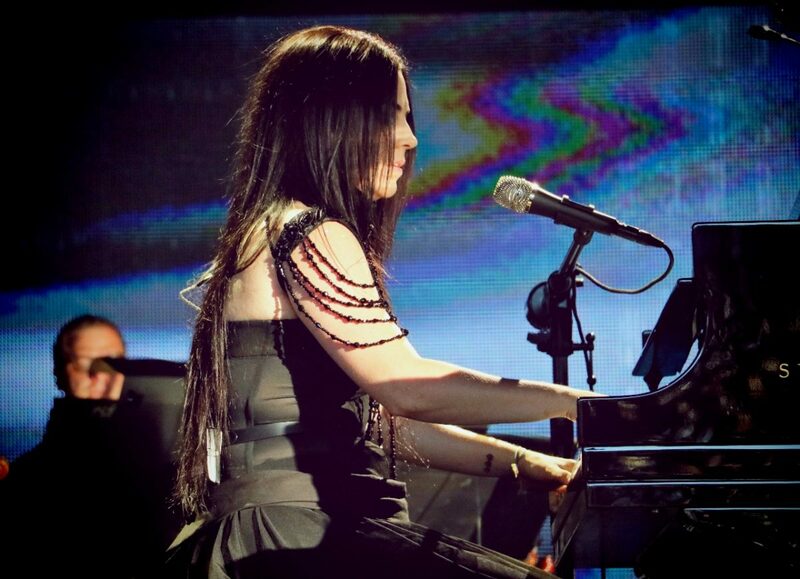 Amy Lee reappeared to close the show seated at the piano with a lovely cover of “Young And Beautiful” by Lana del Ray. Lindsey and Amy faced each other as they played their interpretation. The two incredible ladies united and bowed, with the crowd cheering wildly before their exit. The pairing of Evanescence and Lindsey Stirling on tour together was certainly one of brilliance, with a live orchestra lifting them both to new heights. The tour is sure to be a massive success, continuing through the United States into September.